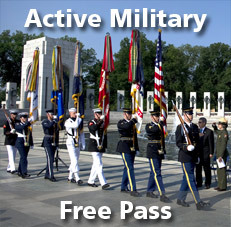 Colonial Williamsburg – Active duty military, reservists, retirees, veterans, and their dependents receive free Colonial Williamsburg admission tickets during Memorial Day weekend—May 22–25, 2015. Explore the Revolutionary City, hear the stirring cadences of the Fifes and Drums, join in the patriotic events, and browse the Art Museums of Colonial Williamsburg. Kings Dominion – Join us May 23-25 and July 4-5 as we pay tribute to our brave military service men and women by offering FREE park admission to any active, inactive or retired United States Service men and women with a valid military I.D. Enjoy activities planned each day along International Street including gettign your picture taken with our Uncle Sam stiltwalker at the front gate, real Army vehicles on display under the Eiffel Tower, a postcard mailing station to send to the troops, sponsored by NBC12, and an appearance by the USO! Also rock out to some awesome live music by our service men and women. Lewis Ginter Botanical Gardens – On Monday, May 25 (only) the Garden will offer FREE admission for military personnel and/or their dependents, with valid military ID card. Anyone else in the party (non-dependents) can receive half-price admission. Join us May 26-27 and July 3-4 as we pay tribute to our brave military service men and women by offering FREE park admission to any active, inactive or retired United States Service men and women with a valid military I.D. Join us for a weekend of free admission, May 25–28. This Memorial Day we proudly invite active duty military, reservists, retirees, veterans, and their families to enjoy access to all our “Revolutionary City” and Art Museums have to offer. Guests can take advantage of complimentary parking at the Colonial Williamsburg Regional Visitor Center, where they can view the short movie The Story of a Patriot and utilize our shuttle bus services. Weekend-long admission is only available at the on-site ticket sales locations of Colonial Williamsburg, including the Visitor Center, the Lumber House Ticket office, or the ticket window in Merchants Square. Appropriate military identification is required. *Service members do not have to be present for offer to be valid. Admission will be provided to dependent family members of currently-deployed troops with appropriate identification. Military Veterans who separated before retirement can bring a copy of their honorable discharge paperwork, DD Form 213, as identification of service.